Texture is one of the fundamental visual design elements of photography. Learn how to use texture effectively to convey emotion and meaning in your photography composition. Texture is one of the most often over-looked design elements! Texture is the roughness or smoothness of a surface. A texture suggests the weave of a fabric. Textures change as you move further away from them; they will be more apparent up close, and fade as the camera is pulled further away. Texture is made more visible with the use of side-lighting, which will create shadows on a surface in proportion to its roughness. Texture is often over-looked as a visual design element. This is strange, since it is often a surface’s texture that draws us to it, and makes us want to photograph it. However, it may be because it is harder to see than lines or shapes. Textures are what fill in the surface of a shape. As we discussed in the article on light, color or tonal contrast creates boundaries between objects. Texture does the same thing. 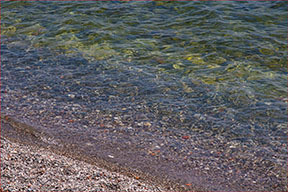 In the image below, a triangle is formed when the texture changes from pebbles to water. There is a secondary “stripe” visible where the pebbles can still be seen, but from underwater, creating an intermediary texture. A boundary between two textures creates two shapes in the image. 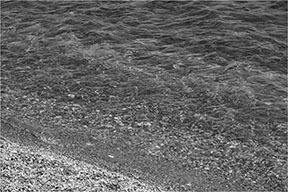 The same image shown in color reveals more shapes that echo the stripe of pebbles. These shapes are created by differences in color (green in the upper left changes to dark brown in the middle). by introducing echoes of the same shapes created by the textures. If you really want to emphasize a texture as the subject of your image, then don’t be afraid to let it take center stage and consume the entire image, as in the following picture of a field of ferns. 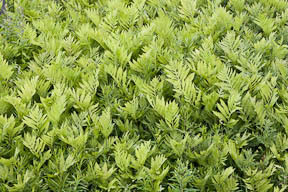 A field of ferns forms a carpet of texture. If you want the texture to be the focus of the image, then you must avoid including anything that stands out as different, and breaks up the texture. 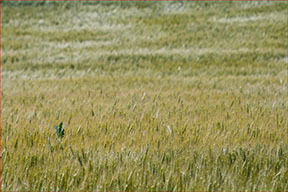 In the following picture composition, the texture of the wheat field is abruptly broken by the sudden appearance of a weed in the bottom left quadrant. The weed is not quite large enough to make a strong subject on its own, so it becomes a distraction. the focus away from the texture. In the image of the wheat field, you also notice that motion of the wind can be used to change texture; a long exposure softens the texture of the wheat as it blows around. Depth of field also changes the texture. A shallow depth of field, where parts of the image become blurred, de-emphasizes the importance of the texture. You can manufacture a texture in your image. You can play some tricks with your camera to create textures in your images. Although artificial, they can be quite effective. 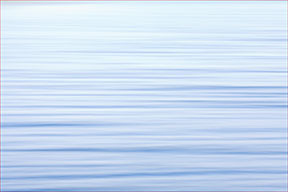 The following image was created by panning the camera horizontally across a lake, with a long exposure. 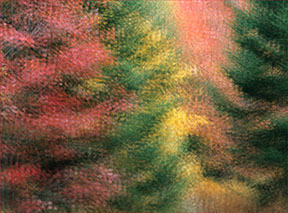 The image below was made with multiple exposures. The camera was handheld so that each frame was slightly out of register with the last. The combination of all the images together creates a look like woven fabric. Experiment and have fun creating your own textures! 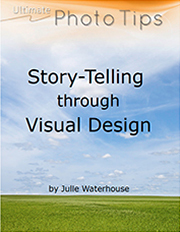 Next, I recommend you read about another visual design element: perspective.